Discovered by K. Itagaki, Yamagata, Japan, using 0.20-m f/3.0 reflector + CCD, who confirmed this TCP with 0.50-m reflector + CCD after discovery and writes there is no recent frame. 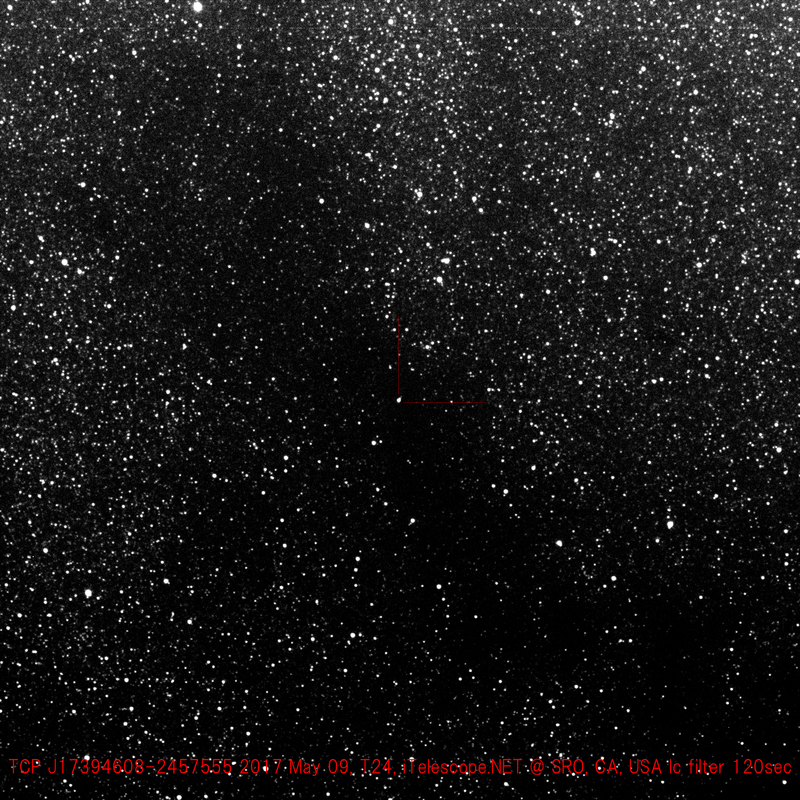 The red star (bright in the infrared) 2MASS J17394584-2457504 is 6" from the reported position of the transient. It might be classical nova rather than dwarf nova as it has red color. "Spectroscopic classification of TCP J17394608-2457555 as a Galactic nova"
"ASAS-SN photometry of the Galactic nova TCP J17394608-2457555"
AAVSO Alert Notice 576 announces the discovery of a nova in Ophiuchus - TCP J17394608-2457555. Please see the Alert Notice for observing instructions and details. Many thanks. V. Joshi and D. Banerjee (Physical Research Lab., Ahmedabad, India, ATel #10369) report that their spectroscopic analysis of TCP J17394608-2457555, the nova in Oph, indicates that significant dust production is likely to occur. 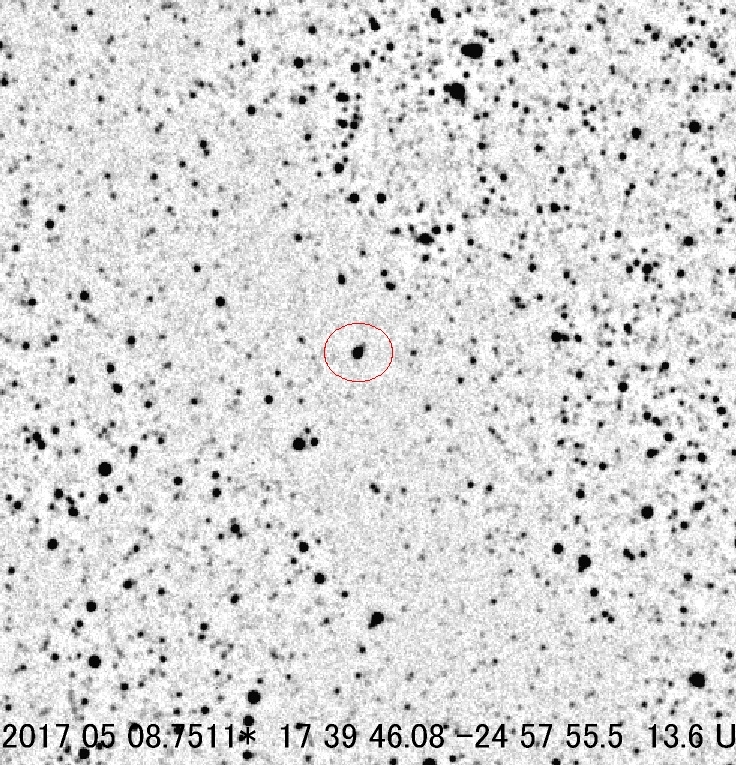 I know that the extremely crowded region in which this nova is located makes it very difficult to observe, but observations are encouraged as the nova continues to evolve. Many thanks for your observing efforts! AAVSO Alert Notice 582 announces a request for observations of Nova Oph 2017 (TCP J17394608-2457555) in support of Swift TOO observations. Please see the notice for details and observing instructions.